View from our room - sweet! 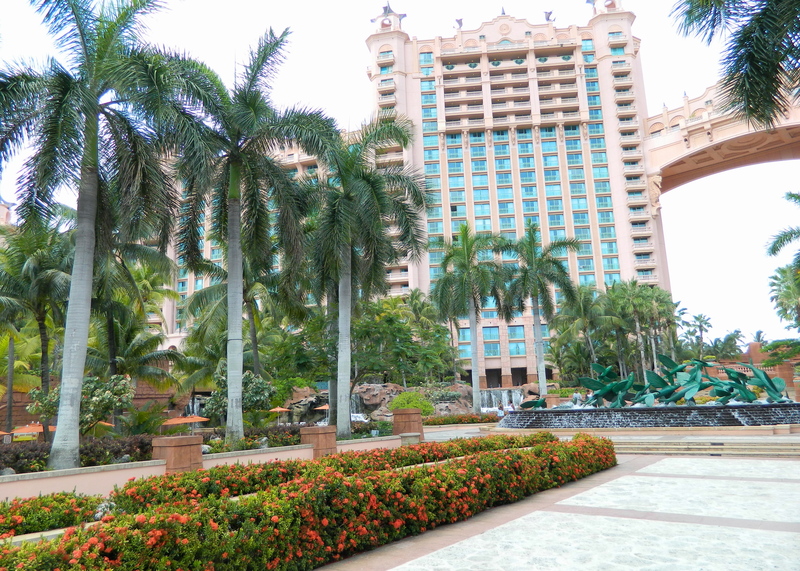 We spent a few days at the Atlantis resort on Paradise Island in the Bahamas this past week. It was a gorgeous place, with the best greenery and landscaping I’ve seen since our little trip to Hawaii a few years ago, and maybe better than most of the places I saw there. Debbie did some serious research (totally unknown to me) and surprised me with my “graduation trip.” She’s the best wife in the known universe! The whole place had this kind of attention to landscaping and great maintenance. It was hot. Around 90 every day, which doesn’t seem like it would be too bad, but being on the beach, it was pretty humid, so if there wasn’t a breeze blowing it was pretty uncomfortable. Luckily for us, there was a breeze at least part of the time – not as much as we would have liked, at under 10 mph pretty much the whole time, but usually it was enough. Of course, it was summer, so one day we got chased off the beach because of the likelihood of lightning. Nothing close by, though. I was surprised somewhat by the extremely wide variety of accents. I assume the majority of folks we met working at the resort were native Bahamians, but some sounded very King’s English, some almost Jamacian, and some had no accent at all, not even sounding like our local “Chicago” type of accent! 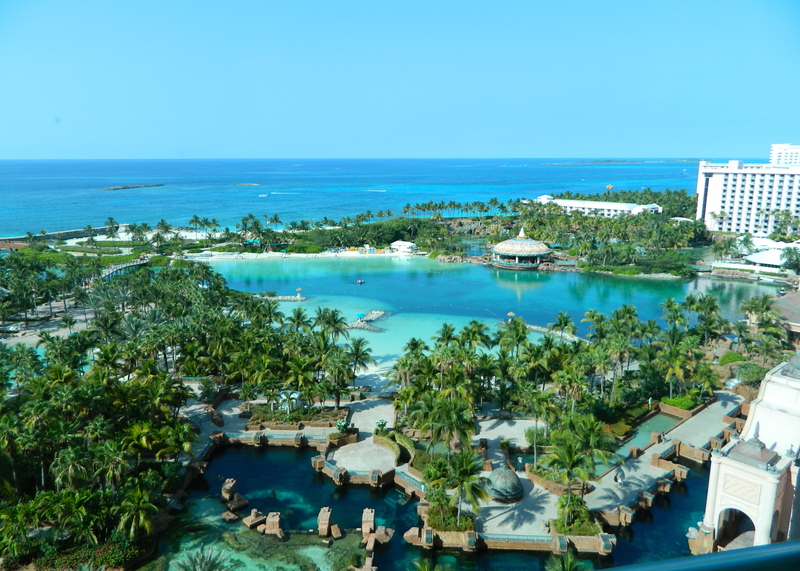 The Atlantis resort is a city in itself and had apparently transformed tourism in Nassau over the last 15 years. It employs somewhere between 7500 and 9000 people, depending on who you ask. The folks we met were uniformly polite, helpful and seemed genuinely to be glad we were there. Now, tourism is their lifeblood, but I’ve been a lot of places where that makes little difference to the employees, and some places where I would swear they wanted you to stay away. No so at the Atlantis whether by good training or sincerity, or both! Our goal was to sit on the beach. Period. We didn’t do a lot else. 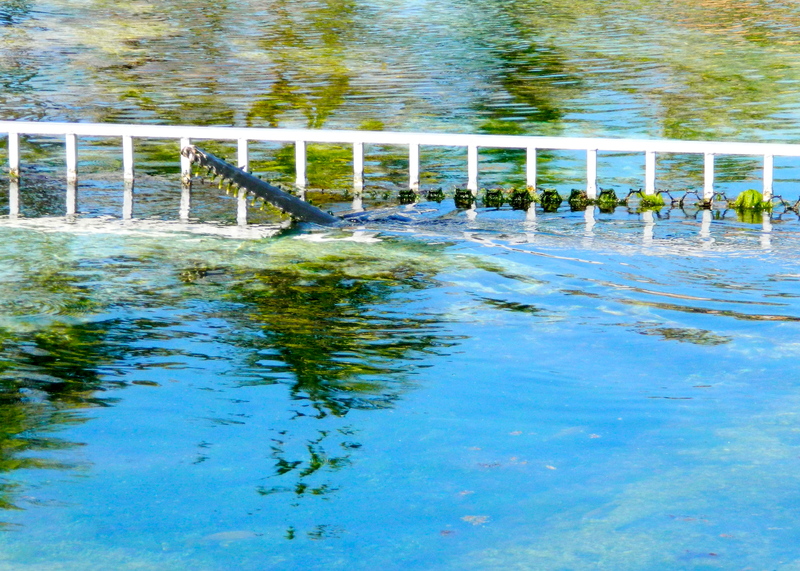 Sometimes we went to one of the pools. 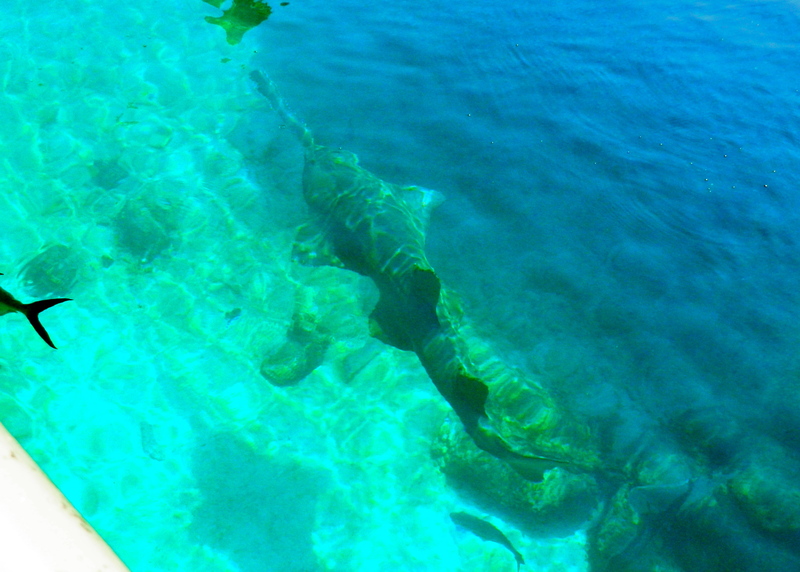 The highlight of the five days there was our experience with the dolphins. They have a full-blown dolphin habitat there, and apparently hired away a senior staff person from Sea World to help them set it up and run it. Smart move; it’s very well done and. We had a great time. 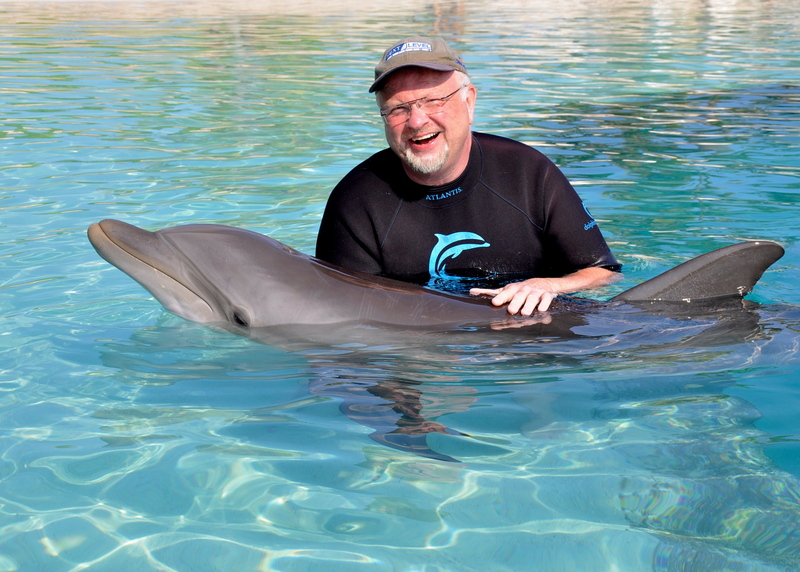 The dolphins are very well trained and appear well cared for. Some of them were rescued from the zoo in New Orleans after Katrina. Their habitat there had flooded and they were released into the wild. They were found and taken to the Atlantis. Since then they have been playing with the guests and having kids – “our” dolphin was a 4 year old daughter of one of the Katrina dolphins, and there was a four month old swimming around us, doing what toddlers do – being inquisitive and looking for attention. She was about 5 feet long and the cutest little thing! Me with my 4-year-old friend! 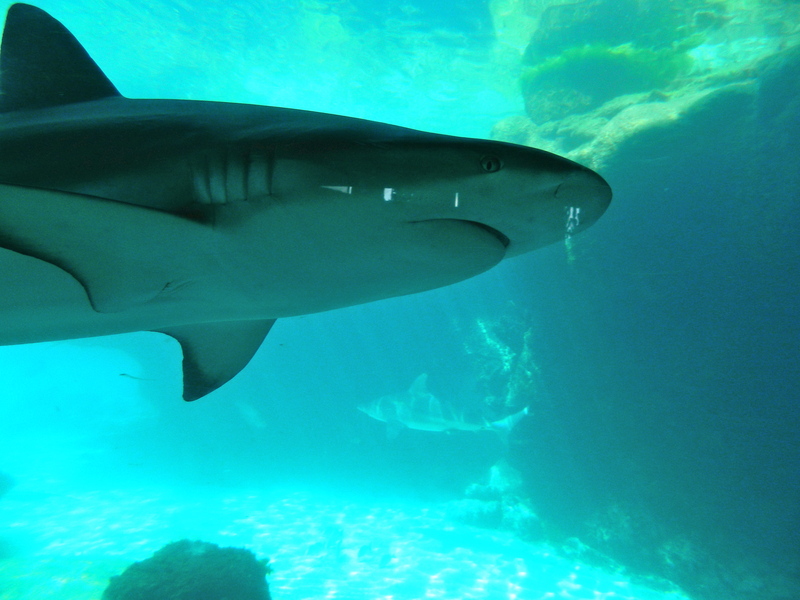 The other big attraction at Atlantis is the ginormous set of aquaria. 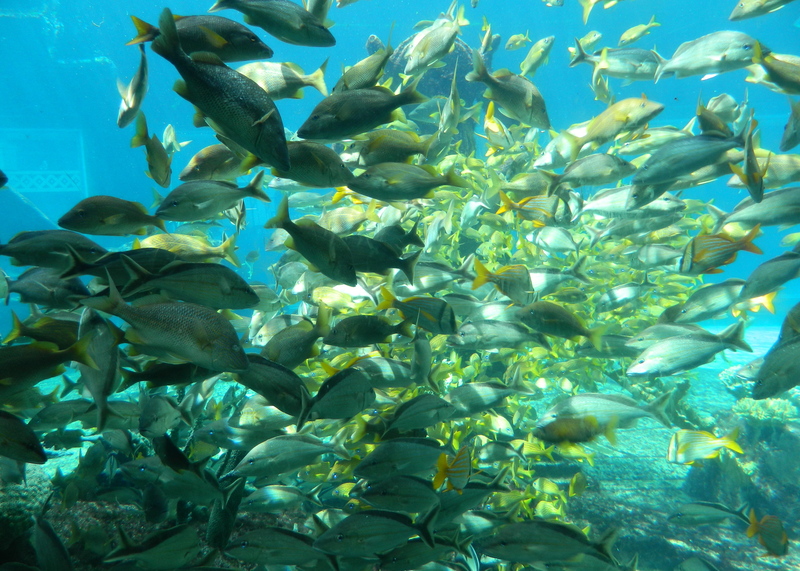 There are several, and they are divided by types of fish, of course. The main aquarium wraps around the Royal Towers, the big middle towers in the complex (and where we stayed). 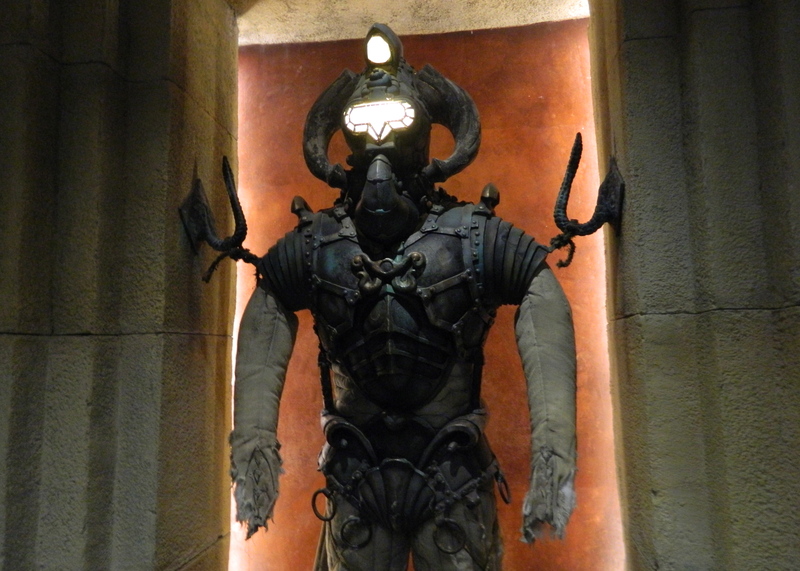 Pretty much anything you see relating to the Atlantis shows one of the inside windows to the aquarium. They are beautiful. The conceit is that the Atlantis is built on ruins of the lost city/island of Atlantis, so the aquarium has a lot of mock ruins of a pseudo-Egyptian look in it. There is also a tunnel called “The Dig” that follows around the snaking aquarium and it contains not only windows to the aquarium, but other “artifacts” from the “excavation.” Oh, and a gift shop, of course! 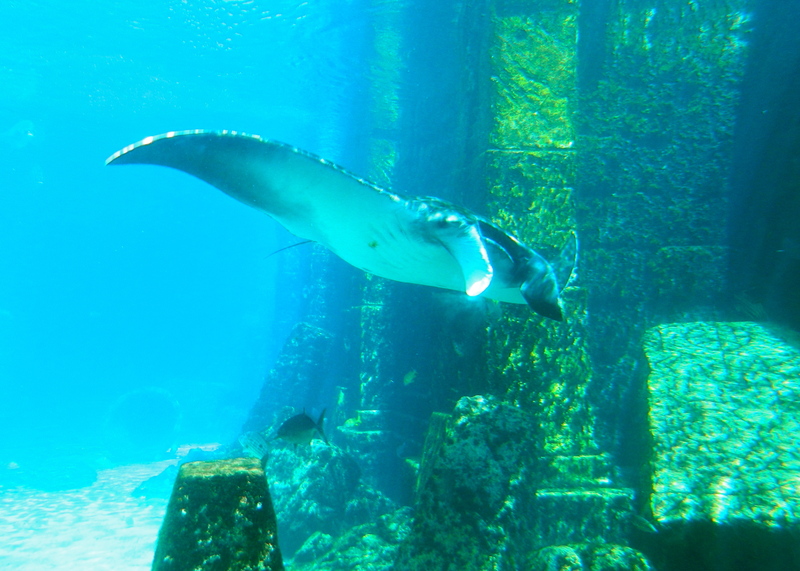 The highlight of the main aquarium for me was a huge manta ray, with a wingspan of at least six or seven feet. "Nice shark, pretty shark." - Londo, "Babylon 5"
This one is about six feet long or more! I don’t recommend them, obviously. The Nassau airport is undergoing a $400 million renovation and it’s pretty nice, but nobody wants to be in any airport for a couple of extra hours for no reason. As much as I’ve griped about Southwest, they would have been falling all over themselves apologizing for a delay like this…even United would have been better, I think! Fort Lauderdale has been nice. 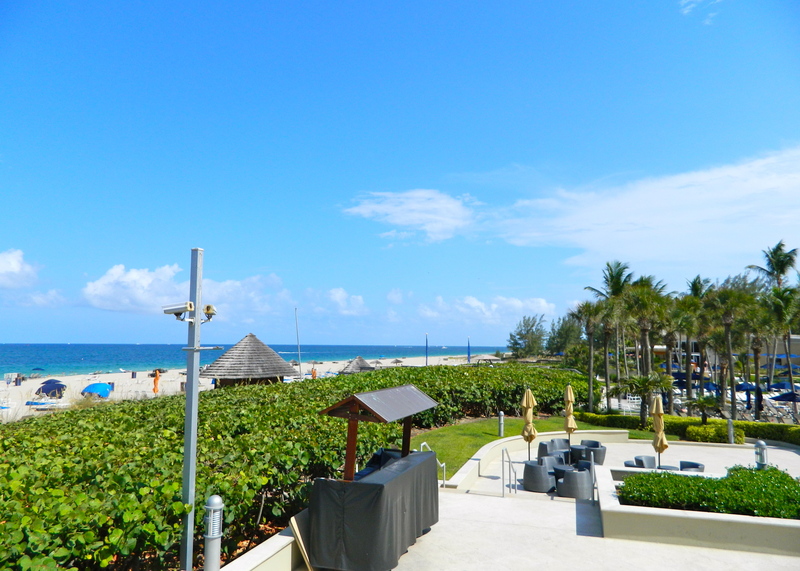 We like the Marriott Harbor Beach, which has its own stretch of beach because it’s far enough south of the public beach area, and the hotel has been recently renovated. The new restaurant, Sea Level, is actually very nice without breaking the bank. 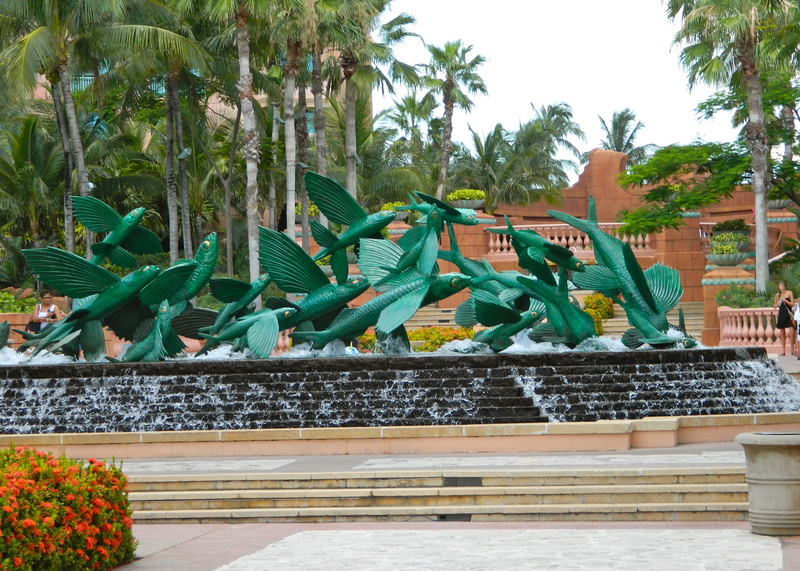 Speaking of money, yes, prices at the Atlantis were high. Sometimes they were ridiculously high, even for resort prices. First, all transactions seemed to be in US dollars.The Bahamas, with some handwaving, has pegged the Bahamian dollar as equal to the US dollar. That seems to be a little shady to me, but with the income of US dollars in tourism (considerable) and the US dollars flowing out as they buy imports from us (also considerable), they are probably pretty locked to us, like it or not. You can’t do much with cash at the resort, though. Most everything can be done as a room charge. That makes it easier than caring cash or credit cards around to the beach – except the beach umbrella guys don’t work for the hotel, and they do cash only! Even the restaurants and shops in the little shopping area outside of the resort are connected to the resort and will take room charges. If you are careful and check around, you can keep from going broke at the outdoor restaurants near the pools, generally by buying the meals instead of just a sandwich. For example, a hot dog is $ 6.50. (Yeah, I know!) but the meal, with a drink and fries, is $ 7.00. The indoor restaurants are expensive, but the food is generally excellent so you don’t feel completely ripped off. 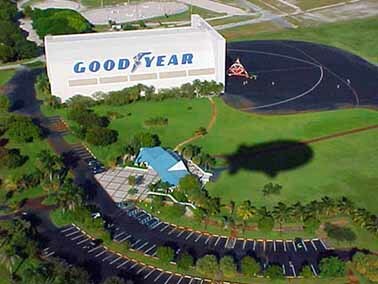 The Goodyear Blimp's home, taken from the Blimp! I won’t gripe about our delay due to a thunderstorm that passed through the area – that’s to be expected. But everything else they could do stupidly, they seemed to. For example, why by the nine billion names of God do they board the plane front to back? It only about doubles the time needed to get everyone on board. Right next to us, Jet Blue was boarding back to front, making sense to me. I swear, American Airlines is being run by idiots. Southwest was run by smart people, then they got greedy. Now they keep telling us how cool they are, but they’re rapidly becoming no better than anyone else. This will probably mean if I fly AA again they will lose my luggage. Oh well. Enough of this! I have work to do! And this makes it sound like I was unhappy! Other than the flying nonsense, it was a greeeeaaaaat vacation! And my wife is the best ever!